I think the purpose was that the children would go with them but not be paraded around but close by so they could be a family at night and there in the early morning. The kids weren't planned into any of the events that Will & Kate attended while on the tour and that's why we only saw the kids coming and going various places when they changed locations. It wasn't that kind of tour, so there were no family based engagements and no one would expect that there would be. Given that, I just wonder would the children have been better off in their own home environment with Maria, rather than in strange surroundings and for the most part without their parents. William and Kate's engagements would have take up the majority of their time, the whole point of the tour after all. I think both behaved very well given their young ages, but they are very young, just now maybe a bit too young to be Brexit ambassadors. When seen from the perspective of the children themselves, I would imagine that they'd feel much more comfortable seeing their parents at least once a day than going for what would seem like an eternity without seeing Mummy and Daddy while the parents were on the tour. It all kind of fits in with what we, ourselves, remember as children. It seemed like millions of years before we would be grown up and could do the things that grown ups do but once we did reach being a grown up, time flies by way to fast for our liking. After looking at the photos of George in the helicopter on the last day of the tour, I've come to believe that when he's with things that interest him or when he feels comfortable; he's at his most confident. 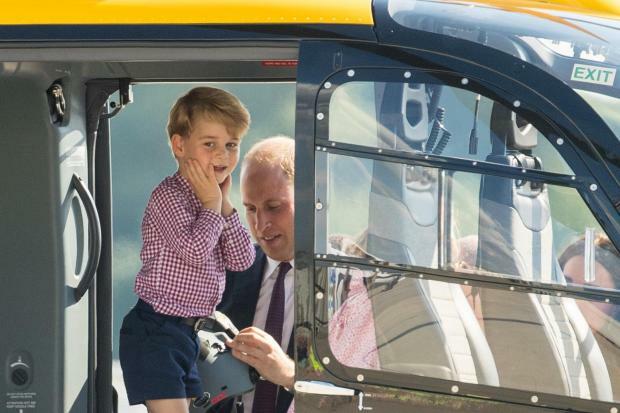 He seemed quite confident when he was in the helicopter, particularly here (this photo is adorable and William's facial expression is every bit the proud father!). A poster in the children's own thread suggested that perhaps George had been asleep on the journey to Poland and saw the crowds when he woke up and didn't feel up to it because he was still tired. I think this was probably the case since both George and Charlotte looked quite sleepy when they were leaving Germany yesterday too. George is still young and therefore still has time to develop his character - and different children have different personalities so George may well be more introverted than his little sister. That photo--I had seen it before but hadn't noticed that was William behind George. I often see resemblances to his cousin Peter or his mother, amongst other relatives, but in that photo I see a bit of his Uncle Andrew. Helicopters and planes seem to be high on the list of George's favorite things. He was over the moon. Interesting; I've never made a connection to Andrew before. To me George looks like Catherine and a young William, as well as Diana's brother Charles - there's a documentary about the late Princess of Wales on television right now here in Britain and there were clips of Charles Spencer as a child and he really did look like his great-nephew. The Duke and Duchess of Cambridge this morning departed from Royal Air Force Northolt for Poland and were received this afternoon at Warsaw Airport by His Excellency Mr. Jonathan Knott (Her Majesty's Ambassador to the Republic of Poland), and subsequently undertook engagements in Warsaw. Their Royal Highnesses attended a Lunch given by The President of the Republic of Poland and Mrs. Kornhauser-Duda at the Presidential Palace. The Duke and Duchess of Cambridge, with The President of the Republic of Poland and Mrs. Kornhauser-Duda, afterwards visited the Warsaw Rising Museum. Their Royal Highnesses later attended a Reception for young entrepreneurs in Poland, the Hart, Warsaw Spire. The Duke and Duchess of Cambridge this evening attended a Garden Party given by Her Majesty's Ambassador to the Republic of Poland and Mrs. Knott at the Old Orangery, Lazienki Park. Sir David Manning, Mr. Miguel Head, Mrs. Rebecca Priestley and Mr. Jason Knauf are in attendance. The Duke and Duchess of Cambridge today carried out the following engagements in Gdansk, Poland. Their Royal Highnesses this afternoon visited Stutthof Concentration Camp. The Duke and Duchess of Cambridge afterwards visited a market in the Town Square and were received by Mr. Pawel Adamowicz (Mayor of Gdansk). Their Royal Highnesses later attended a Reception at Gdansk Shakespeare Theatre. The Duke and Duchess of Cambridge subsequently visited the European Solidarity Centre at Plac Solidarnosci and afterwards laid flowers at the Monument to the Fallen Shipyard Workers. The Duke and Duchess of Cambridge this morning departed from Warsaw Military Airport for Germany and were received upon arrival later at Berlin Tegel Airport by Her Majesty's Ambassador to the Federal Republic of Germany (His Excellency Sir Sebastian Wood) and subsequently undertook engagements in Berlin. Their Royal Highnesses this afternoon attended a Lunch given by Dr. Angela Merkel (Chancellor of the Federal Republic of Germany). The Duke and Duchess of Cambridge afterwards visited the Brandenburg Gate. Their Royal Highnesses subsequently visited the Memorial to the Murdered Jews of Europe and the Visitor Centre. The Duke and Duchess of Cambridge later visited Strazzenkinder. Their Royal Highnesses afterwards were received by The President of the Federal Republic of Germany and Mrs. Elke Budenbender at Bellevue Palace. The Duke and Duchess of Cambridge this evening attended a Garden Party given by Her Majesty's Ambassador to the Federal Republic of Germany and Lady Wood at the Residence. The Duke and Duchess of Cambridge today carried out the following engagements in Heidelberg, Germany. Their Royal Highnesses this afternoon visited the German Cancer Research Centre and were received by Mr. Winfried Kretschmann (Minister-President of Baden-Württemberg). The Duke and Duchess of Cambridge afterwards visited a market in the Old Town Square. Their Royal Highnesses later took part in a rowing race on the River Neckar. The Duke and Duchess of Cambridge this evening attended a Reception for those involved in arts and culture in Berlin given by Her Majesty's Ambassador to the Federal Republic of Germany (His Excellency Sir Sebastian Wood) and the British Honorary Consul at Clärchens Ballhaus, Augustrasse 24, Berlin. The Duke and Duchess of Cambridge this afternoon attended a Reception at the International Maritime Museum, Hamburg, Germany, to mark the United Kingdom-Germany Year of Science. Their Royal Highnesses afterwards visited the Elbphilharmonie, Hamburg. The Duke and Duchess of Cambridge subsequently visited the Airbus production facility in Hamburg. Their Royal Highnesses later arrived at Royal Air Force Marham from Germany. Sir David Manning, Mr. Miguel Head, Mrs. Rebecca Priestley and Mr. Jason Knauf were in attendance. I don't think this story was posted during the tour. The Salvation Army do great work. A REPRESENTATIVE of The Salvation Army's anti-human trafficking team in Poland met with Their Royal Highnesses the Duke and Duchess of Cambridge – more widely known as Prince William and Princess Catherine, the future British King and Queen. The meeting happened during the royal couple's tour of Poland and Germany, at a garden party in Royal Łazienki Park, Warsaw, to mark the birthday of Her Majesty Queen Elizabeth II. The pretzels formed by William and Catherine are now to be auctioned for a good course.